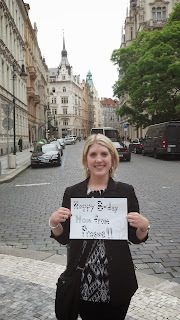 On June 4th we got up early and headed to the Vienna train station. Yes it was chilly and drizzly but all of that nonsense is about to be over! We purchased reserved seat tickets on the next train to Praha (Prague), our last city on our 2013 Europe trip. We don't normally worry about reserved seats but this trip was the longest of our train rides so we decided to do it for the small extra cost. We had a few minutes to wait and it was chilly up on the platform so Megan and I left the luggage with the boys. And we passed time by standing in the walkway area inside below the platforms and watching people go up to the board to their train time and then run up to the platforms. As I've mentioned previously the trains do not hang around for long. With the reserved seats we had 4 seats that faced each other. 4.5 hours later we arrived in Prague. And it wasn't raining (shocker I know). We walked from the train station to the apartment, about a 15 minute walk with our luggage and met the lady who cleans the apartment to let us in and give us the keys, etc. She didn't really speak any English but the apt owner had a welcome packet out for us with all the info needed and even some restaurant suggestions. The 4th floor apartment had a spacious living room and kitchen with two bedrooms and 1.5 baths. Technically 1 total bath but the shower and tub and sink were in one bathroom and just the toilet was in the other bathroom. Kinda odd right? We just used the kitchen sink as another sink. We left the apartment and walked toward the main center of town, about a 10 minute walk. First up we made a stop at a bank and visited the pharmacy because Keith had come down with a cold. Pharmacies are different in Europe than in the U.S. Most or all of the medicines (even over the counter stuff) are kept behind the counter and you describe your symptoms to the pharmacist who then gives you the right medicine. Megan tried to assist Keith by making sucking sounds and gestures to try to tell the pharmacist that Keith needed throat lozenges. Eric and I had to leave the pharmacy immediately we were laughing so hard! Luckily he did end up getting throat lozenges so I guess it worked. This is out in front of the bank. I love how all of the buildings looked in Prague. We wanted to explore the Jewish Quarter area of Prague for a little bit that afternoon so we walked over to that side of town. Unlike many other Jewish areas in Europe that were destroyed during WWII, this area was preserved in order to provide a site for a planned "exotic museum of an extinct race". Extremely terrible that this was planned but as it turns out lucky for the Prague Jewish Quarter, the Josefov. The Nazis gathered Jewish artifacts from all over central Europe for display in Josefov. We had hoped to go into some of the synagogues and the town hall. Unfortunate for us the flooding in the area kept us from visiting those. We hadn't really heard much about the flooding since we weren't keeping up with news during our travels but they had been having usually rainy weather for weeks on end that caused the river to flood significantly. Fortunately the area of town we were staying in and the city center area did not show any flooding signs by the time we arrived. We did walk around the outside of the synagogues and the cemetery. Then we went to one of the bridges nearby to see the river. It did drizzle for maybe like 5 minutes after that on our walk back but spoiler alert: this was the last time we saw one drop of rain on our trip! Prague Castle is in the distance. You can definitely see how much higher the river is... those tall trees look like mere bushes! 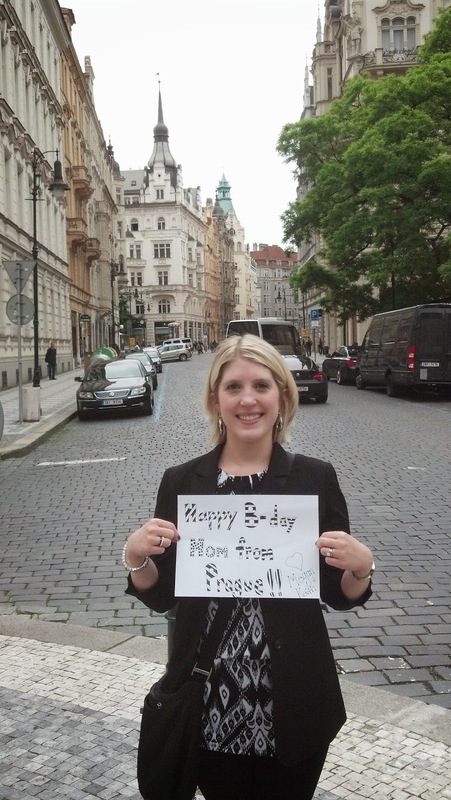 Oh and we couldn't miss wishing a happy birthday to Megan's mom from afar. Then we made a quick trip to the grocery store which was in the bottom floor of a 4 story mall across from where the bank was we went to earlier and then we dropped the stuff at the apartment and headed to dinner. When I saw La Casa Blu, a Mexican restaurant, in the Rick Steves Prague book I knew we would have to eat there. Who can resist Mexican that comes with a recommendation too? Plus Prague isn't know for it's traditional cuisine but they have plenty of other great cuisines in restaurants there.... like Mexican! I had the best quesadillas I've ever tasted.. they were eggplant and zucchini quesadillas. Eric and Keith both had quesadillas too but had chicken instead and Megan had a delicious burrito. Highly recommend a meal at La Casa Blu! On the walk home we spotted a bakery and cafe, Bakeshop. So naturally we had to go in and have a looksie at the dessert selection. I'm gonna go ahead and say this wasn't the last time we went to Bakeshop. We selected some goodies for later. It was hard to choose because everything look so yummy. Then we went back to the apartment and took a stroll around the area. We were just so thankful for the nice weather and being able to walk around outside a bit after dinner. This was a pretty church nearby. Then we ate some of our desserts. Marbled cheesecake and cookies. They did not disappoint! Next up is more Prague!